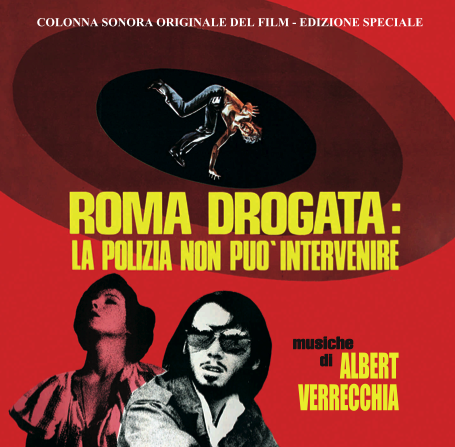 The 255th Soundtrack of the Week is Roma drogata: la polizia non può intervenire (Rome Junkie: The Police Cannot Interfere, a.k.a. Hallucination Trip) by Albert Verrecchia. It opens with a song, presumably for the opening credits. It's kind of an acid hippy rock gospel number. The next track is a driving hard rock song with a guitar riff similar to The Kinks' "You Really Got Me". The only lyrics seem to be "Put it / Put it down". After this comes another guitar rock piece using Bo Diddley's "I'm a Man" groove. This is followed by a trippy instrumental with bells and moaning organ. There's also a lot of interesting percussion. The next track continues the same mood. After this comes something that's like a Sun Ra's "Love in Outer Space" interpreted by Balinese musicians: swirling arpeggios on a few different instruments, swaying bass line, electric guitar and organ playing with space. Sequence 7 brings us back to more driving blues rock territory, with Hammond taking the lead as guitar, bass and drums lay down a rocking foundation. It's over seven minutes long, so there's time for the keyboard player and guitarist to take more than one solo. The next piece is weird spacey improv-sounding stuff, mostly percussion but with some curious, almost industrial noises. Then comes the return of the tune with the "I'm a Man" groove, but this time it goes on for more than nine minutes, so the players really stretch out. Weird, disturbed vocals and children's music box/lullaby music with vibroslap and percussion sum up Sequence 10. Sequence 11 has strange moans and gasps by, it seems, the same female vocalist, but this time they're over a laid back, slightly funky rock groove. Great, driving , African-influenced percussion ensemble kicks off the next track, which also has wah-wahed out keyboard (or is it guitar?) playing. Sequence 13 has a definite groove but a creepy, dangerous feel to it. It's a bit like some of the quieter, more psychedelic stuff on early Black Sabbath records. The next track is like a free-form druggy blues. Then the fifteenth sequence is thirty seconds of wailing distorted electric guitars. After this comes a reprise of the lullaby song but without vocals, a much more straightforward version. Sequence 17 is a Jorma Kaukonen-like acoustic guitar solo. This is followed by organ and percussion sounding threatening and creepy before they switch into a kind of groove. The album concludes with a reprise of the opening song but with singers only on the chorus, nobody doing verses.